Infiniium DSA90000A Series addresses customer development workflow: debug, analysis, and compliance with the highest signal integrity in the industry. Deep Application Analysis: With the ultra-responsive 1Gpts deep memory and powerful hardware-software triggering combination, you can isolate even the most complicated signal to decrease debugging and analysis time. 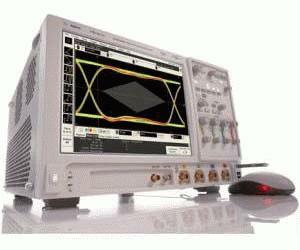 The DSA90000A Series is built around an Infiniium DSO90000A Series oscilloscope and includes standard 20 Mpts of memory, clock recovery and real-time eye diagrams (SDA), basic jitter and RJ/DJ separation (EZJIT+), and bandwidth/noise reduction software included in a bundle that provides you with the right set of tools to debug even the most complicated signals.